» Pear Tiramisù – Tiramisù alle pere, è troppo buono! Pear Tiramisù – Tiramisù alle pere, è troppo buono! I have been in the mood for pears for quite some time , and the thought of making a pear Tiramisù was occupying my mind. For whatever reason, the strawberry version I made a few times was not one of my favorite, the strawberries get easily soaked and mushy and lose color and texture. I am still a huge fan of the traditional tiramisù, the mixture of coffee and chocolate comes straight from heaven, but I thought the right fruit combined with lady fingers and the smoothness of Mascarpone could also make a wonderful dessert….so what goes with pears other than chocolate?….well Rum. So here I am rushing to the Rainbow (one of my favorite store in San Francisco) to get the Mascarpone, not many stores sell the imported Italian Mascarpone but the Rainbow and Ferrari Food do, probably Whole Foods too, but I am not a particular fan of that store, I think it’s overrated and since I had some bad experiences with the quality of their fruits and seafood, I stopped shopping there. Tiramisù in Italian means “pick me up” “tira mi sù” and you really feel the movement of picking it up from its dish when you do so. 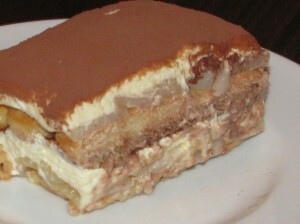 It is the Italian dessert the most famous in the world. It seems that the origin comes from Tuscany around 1600. It supposedly was born in Siena during the visit of the Grand Duke of Tuscany. It used to be called “zuppa del duca” which means “Soup of the Duke” in honor of his visit to Siena. Many other regions have developed a slight different version of it. 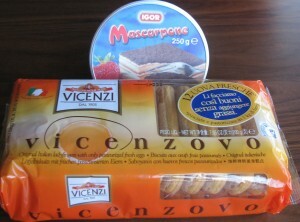 If you make any tiramisù make sure to get the real imported mascarpone. The American one is not that good, the color is darker, and the texture a lot less smoother than Italian one, so as a result your Mascarpone mixture will get hard and not fluffy and the taste will be affected. Peal the pears and cut in 4 quarters each. In a pan, add the Asti wine, which is a sparkling sweet wine, the agave honey, vanilla and the juice of the can of pear, stir all the ingredients and add the pear quarters. Cook for about 10 min or until the pears are cooked. remove the pear from the pan and keep the liquid. Set aside. Take the pear from the can and make a puree with it, add some sugar and a very small amount of vanilla extract. Set aside. In the meantime, separate the whites from the yolks, and beat the yolks with sugar until it doubles volume and the mixture becomes to whiten. Add the mascarpone. Beat the whites to a stiff consistency and add to the egg/mascarpone mixture. Mix the pear juice with the liquid used to cook the pears. Dip the lady fingers in the liquid and place in a tray, cover the tray and drizzle half of the rum. Cut the pear quarters in small dices and cover the lady fingers with it, then add a layer of pear puree, add the mascarpone mixture, and sprinkle with cocoa. Add another layer of lady fingers, using the same process as before. At the end, when you finish with the mascarpone mixture, do not add the cocoa right away, wait to sprinkle the cocoa at the end just before serving. Place in the refrigerator for at least 4 to 5 hours. This entry was posted by silvia on December 16, 2008 at 12:02 am, and is filed under Desserts. Follow any responses to this post through RSS 2.0.You can leave a response or trackback from your own site.